He was faster than Boardman from the very start of his effort, recording a time of 1’15.01 (versus 1’17.891) for the opening kilometre. He went through the 5 kilometre point over three seconds up, and by the 25 kilometre point he had extended his advantage to just under 7 seconds. This continued to grow to 18 seconds by 40 kilometres. 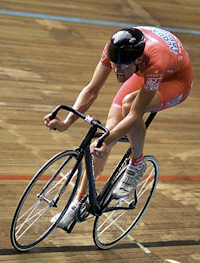 In his attempt, Sosenka was using a 54×13 gearing, a 3.2 kg rear wheel and 190_mm cranks, with his bike weighing a total of 9.8 kg. The reason for the heavy wheel was that although it was harder to get up to speed, it was easy to maintain it. The handlebar of his bike was set very low. This allowed him to keep the arms more or less stretched out and still get a very low position. One can use the split times to plot the average speed at a given distance. 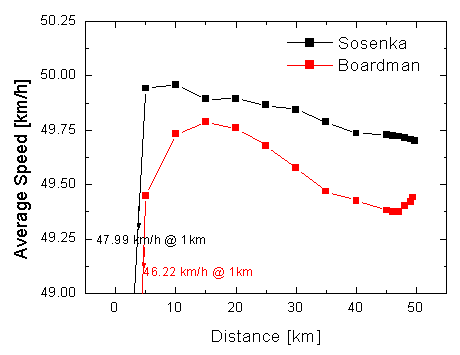 Boardman started quite slow, but after some kilometers with a speed around 50 km/h he reached an average speed of about 49.7 km/h. Then he went slower and slower, until his final effort pushed him to 49.441 km. 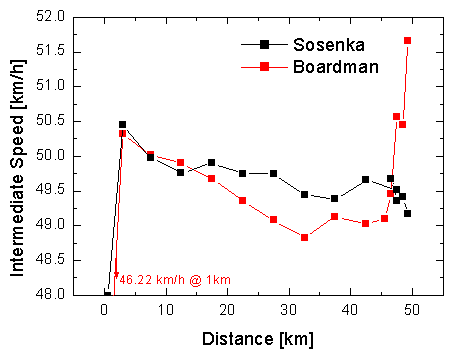 In the first 10 km Sosenka and Boardman rode almost at the same speed, but Sosenka had covered the first km 3 seconds faster, that gave him the advantage in the average speed (look above). But after 15 km Boardman faded and his speed dropped even below 49 km/h. In the last three minutes he gave it all, riding some laps with more than 51 km/h. Sosenka’s ride was much smoother, just slowly getting slower.